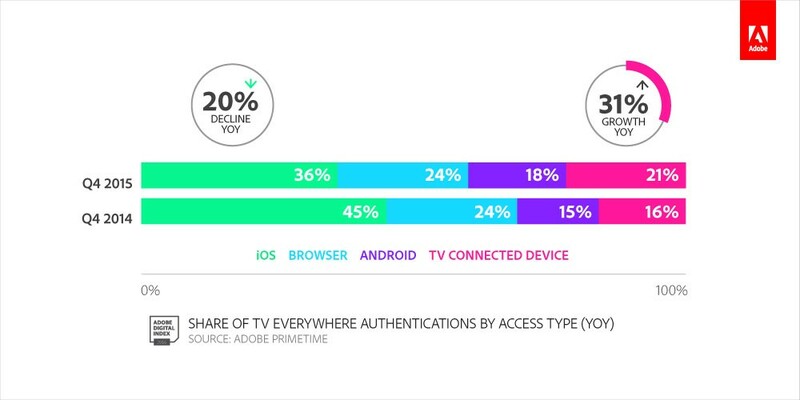 An increasing percentage of viewers are opting to watch authenticated video on demand (VOD) content on their televisions, rather than on their iPhones or iPads, according to a new report by Adobe Systems Inc.
Based on a survey incorporating some 134 billion views of authenticated VOD – that is, TV channels streamed online for subscribers only – between October 2014 and December 2015, the report by Adobe’s Digital Index division discovered that while iOS devices such as iPhones and iPads remain the most popular way to view authenticated VOD – which Adobe refers to as “TV Everywhere” – their overall share of total viewership decreased by 20 per cent between 2014 and 2015, while the percentage of content streamed on televisions through connected devices such as Apple TV and Roku grew by 31 per cent. 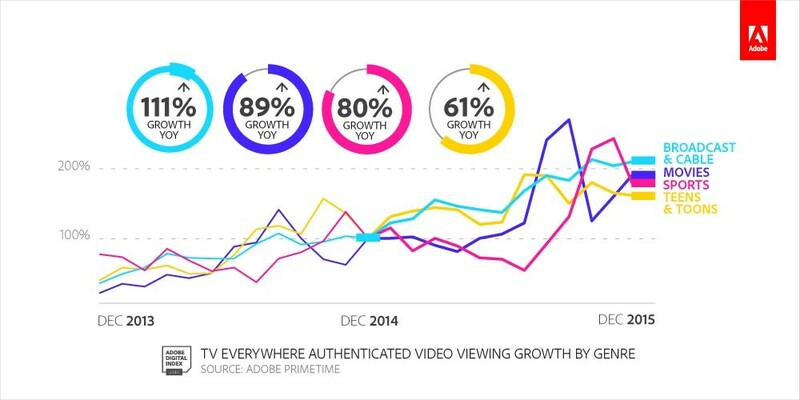 The number of authenticated VOD users increased too, by 22 per cent from 2015’s third quarter to 2015’s fourth quarter, which Adobe researchers attributed to the availability of special programming such as fall TV premieres and sporting events such as the MLB playoffs, and overall viewership of authenticated VOD doubled between 2014 and 2015 – a trend Adobe expects will continue. It should also be noted that except for browsers, all modes of access were used with increasing frequency, Adobe said, with Android and iOS especially experiencing substantial growth. 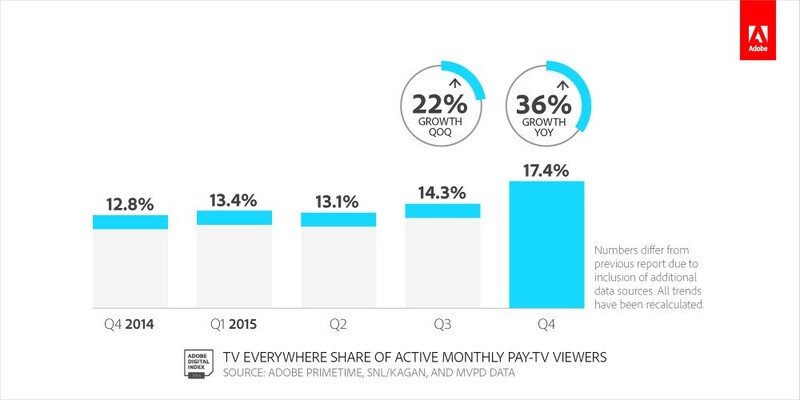 However, the number of television subscribers using authenticated VOD remains quite low overall, the company said, with only 17.4 per cent watching paid television content online. 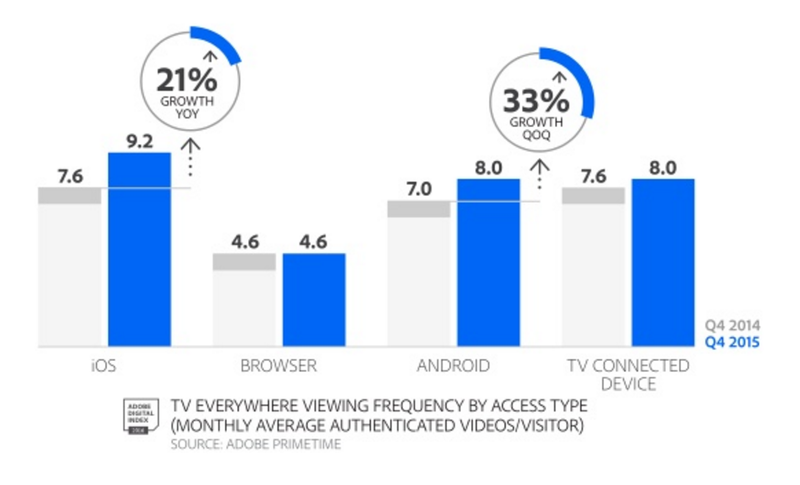 Also worth mentioning is the type of authenticated VOD content that viewers are watching, with viewership of broadcast and cable content growing by 111 per cent between 2014 and 2015. Other popular genres included movies, sports, and entertainment aimed at teens. The takeaway, Becky Tasker, Adobe Digital Index’s managing analyst, said in response to the report, is that marketers need to recognize where consumer behavior is shifting so they can optimize their advertising strategies. For example, Adobe Digital Index staff noted, this year’s Super Bowl ratings were actually lower than the record-setting high achieved in 2015 – hardly a surprise, since CBS offered so many streaming options.